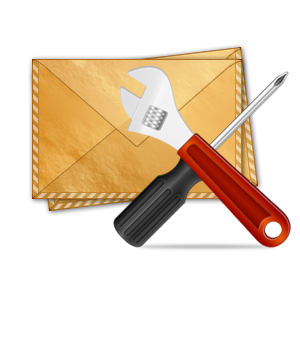 The number of Outlook users is growing day-by-day; however, this is not because of the set of features it includes, but because of mailbox portability feature that users ever have been wishing for. In fact, Outlook has been making the developers at Microsoft proud for a long time and the same would continue if the users get their daily problems fixed before they go beyond repairing. Well, I am talking about a few common problems like you hit the ‘reply all’ button in the mass emails and make a fool out of yourself. Likewise, you can also refer to a scenario when you accidentally hit the ‘send’ button, and then find stupid mistakes in the contents of the email you just sent to your boss. Perhaps you may not find Outlook but yourself responsible for these ‘so-called’ Outlook common mistakes. However, you can actually think of some Outlook inbuilt features that can prevent instant email delivery and let you verify email contents. 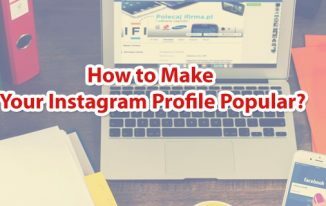 Luckily, you are provided with some like inbuilt tools that you can try to make your emailing experience full of contentment. I, in this post of mine, will walk you through some of common mistakes and their corresponding solutions, aiming to make your Outlook experience the way you ever wanted it to be. Emailing system, as you know, is the easy and inexpensive means of communication across the world, it is also used in corporate as the prime means of information exchange in both one-to-one and one-to-many modes. Outlook is the email client from Microsoft, and is preferred the most in collaboration with Exchange Server in most companies today. However, some common mistakes in communication often create problems that we are going to discuss in the below section. Not talking about somebody specific, I would rather want you to take it general – you might have been in a situation that you replied to your boss’s email without having a further look at what you have typed-in, and later on you had to face his anger. It often happens when you are in some kind of stress or your mind is roaming around while you are sitting in the office. Well, I would say take a deep breath and just relax; take your time to end up with your work, and then think of doing things that are most crucial to you. 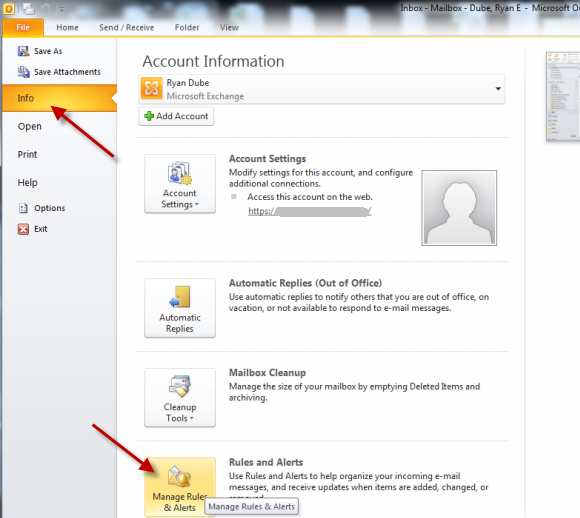 In Outlook 2010, navigate to File tab > Info > Manage Rules & Alerts. Important: In these steps, I am going to make you create a rule to delay email delivery by 5 Minutes (or more time) so that you have time to go through the email again, even after clicking Send. In the mean time, you can make changes if required and save yourself from getting highlighted for your mistakes. 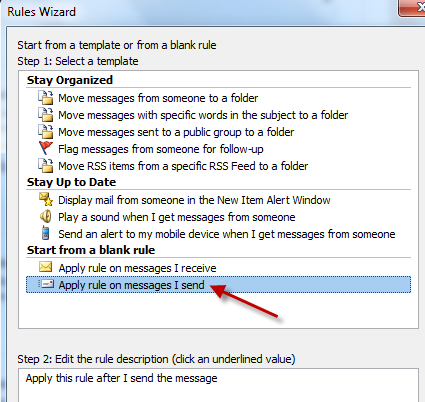 In the Email rules dialog, click New Rule option, and then click Apply rules on messages I send on the Rules Wizard dialog. Important: This makes the rule work on the messages being sent when you click ‘Send’. You further have more options to modify the rule you create. 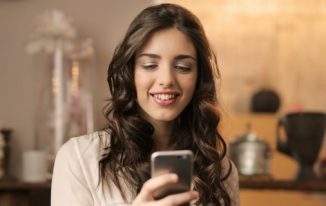 For instance, you can limit the number of messages this rule is applicable to, modify the rule for messages containing specific words in their body, and more. I simply want to delay the delivery of email messages, and therefore I click ‘Next‘ and then click Yes on the warning pop-up to specify the rule is correct and create it. Click the defer delivery by a number of minutes check box, and then click a number of link in the below section to specify the delay time (in minutes) in the Deferred Delivery dialog. Make sure the time you specify is enough for you to go through the sent message and make corrections or cancel delivery if required. Click OK to save and apply the rule. Click ‘Next’ and proceed to the end. 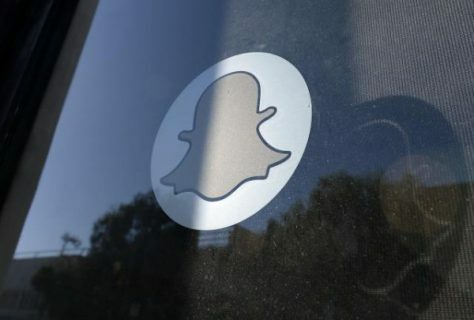 Along with the aforementioned rule you create to delay email delivery to everyone, you can narrow down a rule to apply only when you send email to some specific users. Out of some already created rules, you can choose one or more based on your requirements. Another common mistake you often make is sending the message to one who is not supposed to receive that message. Actually, when you start typing the email ID of the recipient next to ‘To’, you see some auto suggests that Outlook brings from your address book, or they might also be amongst those who you recently sent emails. 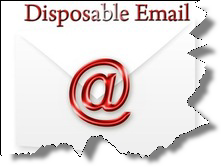 When you type the initials of the email ID of the intended recipient, you might see a list of suggested email IDs having a combination of those initials common as that in the one you are typing. In that list, you see the first email ID selected by default, which might make you think that the recipient ID already exists in your contacts and you simply hit the ‘Enter’ key. However, the intended recipient is someone else. If you select your boss’s email ID and send him something that he was not at all supposed to see, you will just get screwed. Outlook allows you save yourself from such a painful situation simply by pressing the ‘Ctrl + K’ keys right after you type-in the first two initials of recipient’s email ID in the To field. This Open the Check Names list and enables you choose and verify the recipient’s email ID carefully. 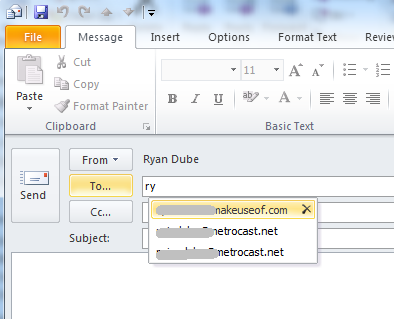 Click Office icon and choose Outlook Options. 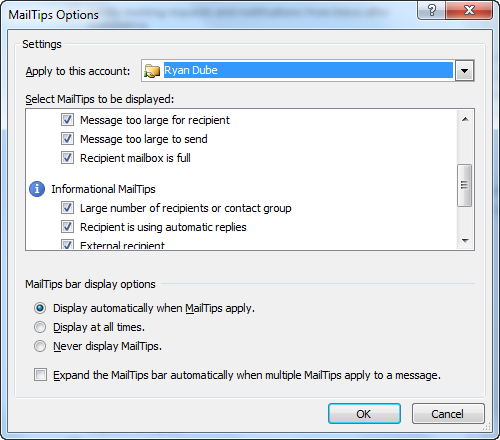 Select Mail in the left pane and click MailTips Options in the right pane under MailTips section. 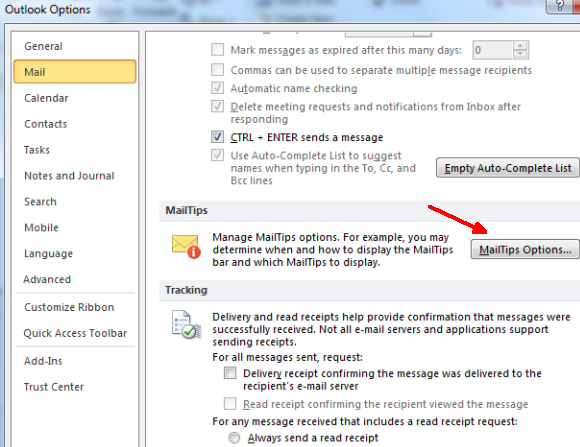 In the MailTips Options dialog, check the check boxes in front of the tips that you want should display as per the need. Once you are done checking the required check boxes, makes sure ‘Display automatically when MailTips apply’ radio button is enabled, and then click OK. Important: MailTips throws warning messages when you are sending email to an invalid address, or even when the address you are sending email to is a group of recipients. I suggest you to implement all three tips mentioned above to avoid the odds for headache and enjoy worry free emailing, as you must avoid Outlook common mistakes that you have been making in the professional life. About Author: Eric Simson is working as a Technical Content Writer with Stellar Information Technology Pvt Ltd, which provides solutions for hard disk data recovery , Exchange EDB Recovery , password recovery, file repair and various email converter tools such as ost to pst conversion, edb to pst conversion and many more tools for migration and recovery. 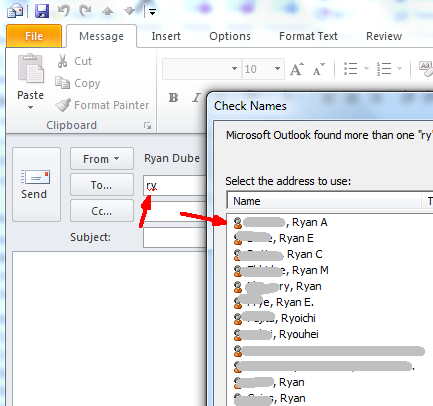 I am outlook user but I was not aware about this mistakes and how to prevent this. 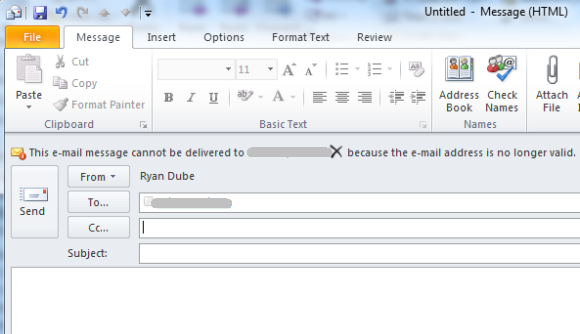 Thanks Eric and TTW for the tips to make sure we avoid common mistakes while sending emails from outlook. On second tip users can also disable auto suggest option which is enabled by default.Users can navigate to File -> Options -> Mail tab and uncheck Use Auto-Complete List to suggest names when typing in the To, Cc and Bcc lines check box located at bottom and also click Empty auto complete list which will clear the stored list. Thanks for these tips Eric and TTW. On second tip users also have an option to disable auto suggest option. File – > Options – > Mail tab and uncheck the checkbox at the bottom with label Use Auto complete list to suggest names when typing in To,Cc and Bcc lines and also click on Empty Auto complete list to clear the stored list. Ever since I discovered gmail, I have had no intention of leaving them. Emmanuel recently posted…How to stay successful forever in Blogging? OnePlus Two or Next Nexus! 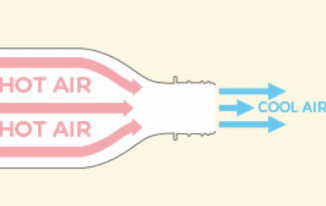 Which one is good for you?